My friend Tim has decided to create an advent calendar in September for credit unions. I have been remiss in commenting much on his blog lately, but this series has brought me back. So many good ideas, so much good dialogue amongst his commenters. You can see all his different posts here. And it’s worth pointing out that Tim is one my partners in crime in planning BarCampBankBC2. Join in the conversation by coming down to join us. Yesterday, my friend Tim McAlpine who is helping to plan BarCampBankBC2 with myself and Gene Blishen, blogged that BarCampBankBC2 is less than 60 days away. So true! Things have been so busy, I haven’t written much about BCBBC2 recently, but I am very excited about this banking innovation event. It’ll take place on Saturday, September 26th from 9am to 5pm at Vancity’s head office at 183 Terminal Avenue in Vancouver (map below). I especially want people at local banks and credit unions to attend and join the conversation. We’re charging $10 (CDN) to cover a pizza lunch and to ensure people will actually show up if they say they will. You can register for the event now. If you’re coming, please add your name to the wiki. BarCampBankBC2 is coming in September. I was thinking about whether or not we’d want to do another BarCampBankBC this year. Budgets are tight, and the industry is in a very different place from when we were organizing the event last year. So I reached out to Tim McAlpine and Gene Blishen, my partners in crime from last year, to discuss. We wondered if a smaller, scaled-back event, with a more local flavour might be a nice idea. No sponsors, no fancy meals, just a place to brainstorm about banking innovation and some amazing people to do the brainstorming. I am very excited to announce that BarCampBankBC2 is on! It’ll take place on Saturday, September 26th from 9am to 5pm at Vancity’s Head Office. I especially want people at local banks and credit unions to attend and join the conversation. 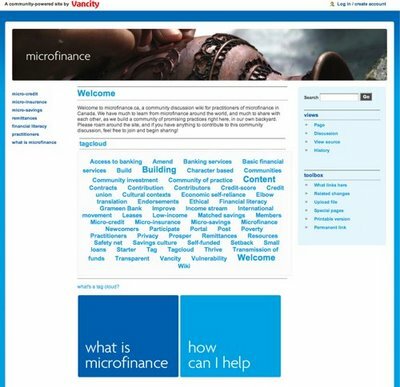 Vancity and the Microfinance wiki. I am so pleased to announce the new wiki Vancity has launched. It is for the Microfinance community in Canada, and lives at microfinance.ca. Why did we launch a wiki? Well, in short, we are a longtime Microfinance practitioner wanting to expand knowledge amongst those who are involved with Microfinance in Canada. We have a product called Circle lending, in which a peer group takes out very small loans together, and help each other to succeed in what are usually home-based businesses to repay their loans together. It is an amazingly transformational product, designed to help lift people out of poverty and give them a new chance. Additionally, we have a Microcredit Toolkit, which is an open source peer lending model so any institution can replicate it. We were incredibly honoured that Muhammad Yunus, who won the 2006 Nobel Peace Prize for founding Grameen Bank, personally endorsed our toolkit a couple of years ago. As you can see, we are deeply involved with the Microfinance model in Canada, and wanted to create a place where we could take the open source concept a little further. So we created and are hosting a wiki where anyone can add information as a practitioner, researcher or follower of Microfinance in Canada, with the aim of growing and evolving a central knowledge repository about the subject. I think it’s a great example of a very inexpensive solution to create affinity within a specific community. Now let’s see if people find it useful. I want to recognize the amazing Catherine Ludgate, who manages Vancity’s Microfinance programs, and without whose support this never would have been launched. The second I came up with the idea of a wiki to bring together the Microfinance community, Catherine was enthusiastically on board. If you want to know more, here’s a great article about Catherine.